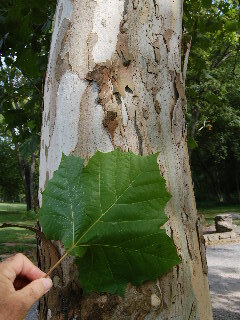 The American Sycamore (Platanus occidentalis) is a favorite tree planted by both homeowners and municipalities. Its popularity is due to its relatively fast growth rate and its gigantic size, allowing the friendly giant to quickly take its place in the landscape as a shade-producing phenomenon. The sycamore is relatively undemanding of soil types and growing conditions, although it will perform best in loose rich soil with plentiful moisture. In its natural state in the forest environment, the sycamore is in fact often found thriving in alluvial soils in river-bottom sites. The tree has a wide-spreading open branching system off a main trunk that leads into a widely open crown—the result being a tree that is both broad and tall on the landscape. The large simple leaves are bright green on the upper side and lighter green and somewhat hairy on the underside. Those big green leaves turn to beautiful shades of yellow and golden-brown in autumn before they fall to the ground. While some might consider cleanup of the fallen leaves a maintenance nuisance, the dry leaves actually mulch quite easily under your power mower. Fruit is borne in the form of seedpods that are globelike and about an inch in diameter and hanging on stems several inches long. Again, while some might consider the seeds a nuisance to deal with, the small problems they cause are more than offset by their beauty. The most striking visual aspect of the sycamore tree is the unusual bark. The bark is of a peeling and scaly nature. As the tree grows and ages, the exfoliating bark reveals blotchy patches of white, silver, and greenish colors. 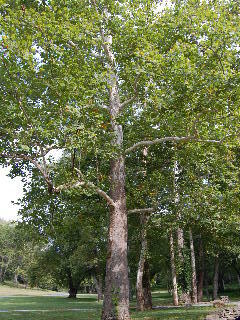 Sycamore trees are often available for purchase at your local garden center. If you want a fast-growing shade tree for your home landscape, something a little different from the usual maples, give sycamore a try. Just be sure to allow ample space for growth, both laterally and vertically (don’t plant your sycamore tree under a power line). Sycamores can grow to heights in excess of 100 feet and can not only survive but thrive and add continuous beauty and shade to your landscape for more than 100 years.